If you know Brazilian food, you’ve probably heard of feijoada, the country’s national dish. One of the most typical foods in Brazil, it is a black bean stew cooked along with a selection of pork cuts such as ribs, tenderloin, and smoked sausage, as well as jerked beef. A complete feijoada usually brings rice, slices of orange, farofa (a toasted manioc flour mixture), chopped cabbage, fried manioc (which looks like french fries but is far tastier!) and deep-fried pork skin, known as torresmo. The pork cuts are sometimes cooked overnight and are what give an incredible flavour to the meal. Garlic, onions, and hot spices are also added to the mix. The dish is so tasty, and, naturally, goes really well with a caipirinha — the national drink of Brazil. In Rio de Janeiro, there are a few great places to try feijoada. One of them is at Bar do Mineiro, in Santa Teresa. It is a locally owned, informal and cosy restaurant, full of good local food and history. It’s a very typical carioca (as locals are known) place. Another delicious option, for those who don’t want to leave the southern area of the city, is at Joaquina Bar & Restaurante, which has two addresses (in Leme and Humaitá) and shows off Brazilian history in its decor. Being one of the most important dishes in Brazilian cuisine, feijoada plays a bigger role than just offering up amazing flavour and spice. There is a history to this dish, as well. 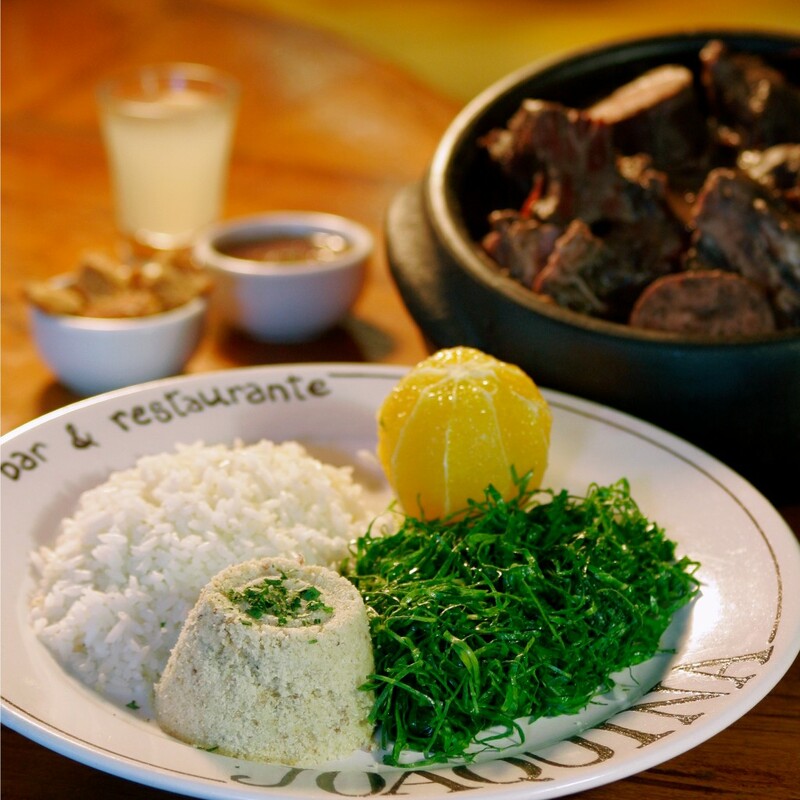 Feijoada was originally prepared by slaves, who would cook the leftovers their masters used to throw away. As the slaves did not have much food to eat, anything they could find left behind was considered an ingredient — even parts not commonly used, such as pork feet, ears, and tail. Fast forward a few centuries, and feijoada became a fancier dish. Today, it is not only part of the Brazilian gastronomy, but also its culture. Traditional feijoada can be tasted at samba parties at the best samba schools of Rio. Talk about a perfect combination: samba, feijoada, and caipirinha! Now that you know a bit what a feijoada is and where it came from, how about giving it a try at home? Here’s a recipe for you to take a culinary adventure in your own kitchen. Enjoy! Let the black beans rest in a water basin overnight. Make sure the water covers the beans. Do the same with any salty cut, so that it does not salt the meal too much. You might need to change the water at least once during the process, otherwise, the salty water will keep the cuts salty. Cook the black beans in a pressure cooker for 30-45 minutes. Cook the jerked beef and the other cuts in a pressure cooker for 30 minutes, until soft. Boil the paio and calabresa sausages. Wait for 5 minutes after the water boils. In a deep pan, fry the onions and garlic in hot oil. Add the beans to the pan to soak the mixture, then put them back into to the cooker. Add the jerked beef, pork cuts, and sausage, and mix it all up. Let it cook for 2 or 3 hours until the water begins to thicken. Add more water as needed. Hungry for Brazil? Let us show you around local life with our Rio de Janeiro tours!